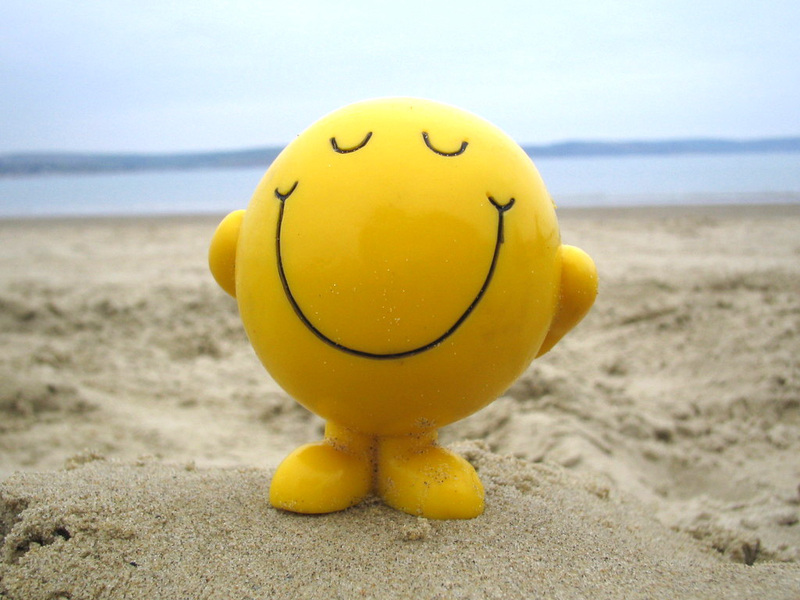 That means I get to kind of start fresh this week. I have my weight and I know it’s right because I changed the battery in the scale. I thought about doing measurements, but I’m too lazy for all of that. I have gone the entire week without forgetting to take my vitamins! 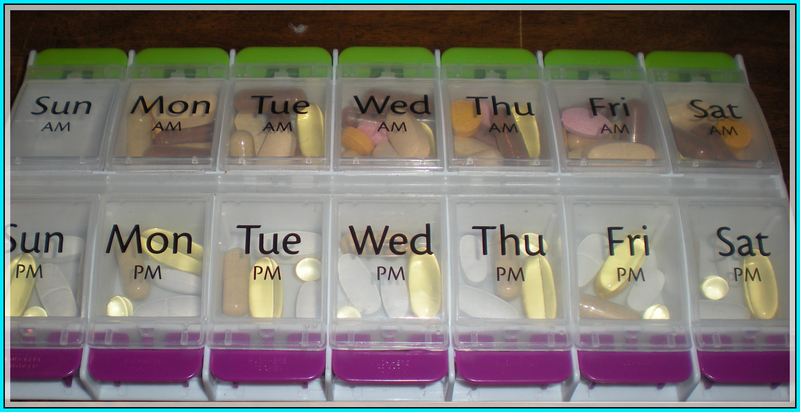 I just reloaded my pill box for this week as well. The vitamins have actually been helping a lot. I have already noticed a difference in my nails. Since I returned to retail I have not been able to keep long nails. This week my nails have shot out! I wish I had a before and after picture to show you. They are stronger and less brittle. I have one nail that has cracked (?) below the quick and it hurts like a mofo, but it hs still stronger than my nails have been in a long time. I’m also not as hungry as I usually am. Every day I have had three meals a day and on a couple of days a snack. I don’t know if this is because of the vitamins, the green tea with lemon, or the 3 liters of water that I have been drinking. Sunday and Monday I failed to make it to 3 liters of water, but I am making sure to throw back the water through out the day. I have had a few days that I saved too much at night and it interrupted my sleep when I had to get up and go to the bathroom. 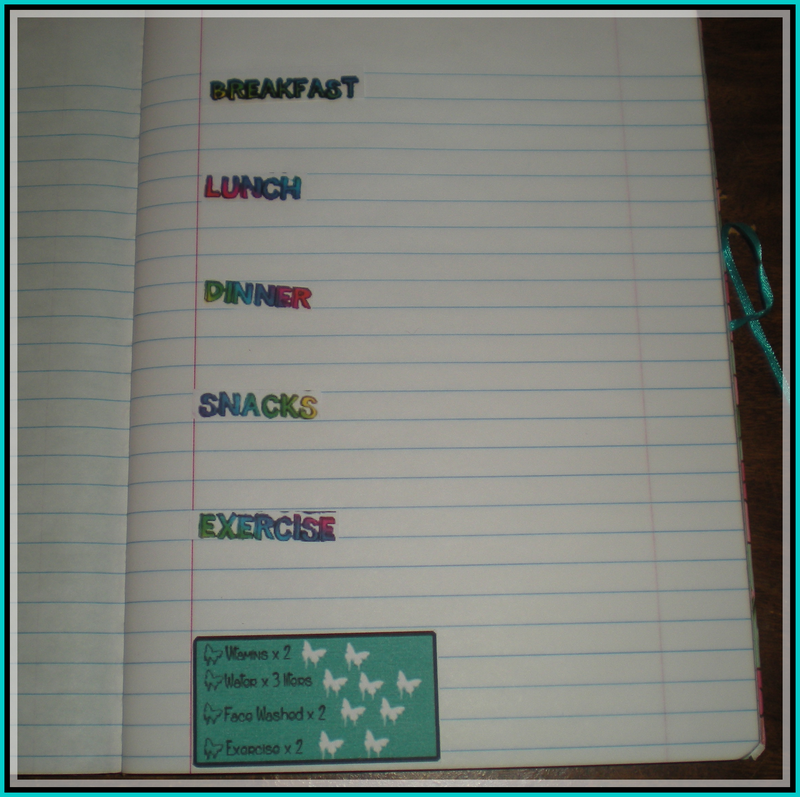 I have prepared somethings for this week to help keep me on track and to possibly help me lose some weight this week. My goal is to lose 2 pounds this week, just because I know I can do it. I just have to stay away from all the sweets, which honestly, I only had two sweets this past week. 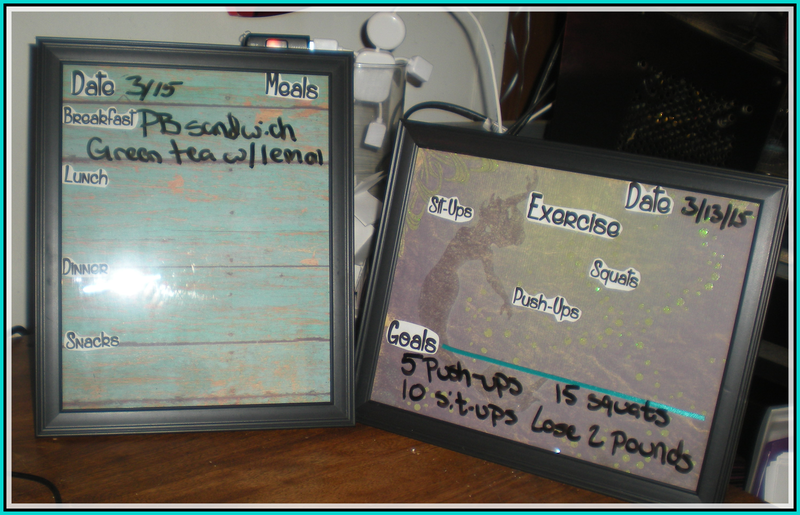 First I made some dry erase boards out of picture frames. One is to write out what I have eaten that day, the other is for exercises. I just took some scrapbook paper and cut it down to size, then added the printed out words that I decided I needed on these boards. Ignore the date on the exercise board. I haven’t updated it yet. I was just making sure my pen was dark enough. I did write my goals for this week for exercise. I want to start small seeing as I have been a little out of practice lately. I did 10 squats the other day and had sore legs. That honestly made me sad. I used to could do at least a hundred squats before my legs started feeling it too much. I have never been able to do a lot of push-ups. And sit-ups…another one that makes me sad. I remember in elementary school I could leave my entire gym class in the dust when it came to sit-ups. The next thing I made was my food journal. 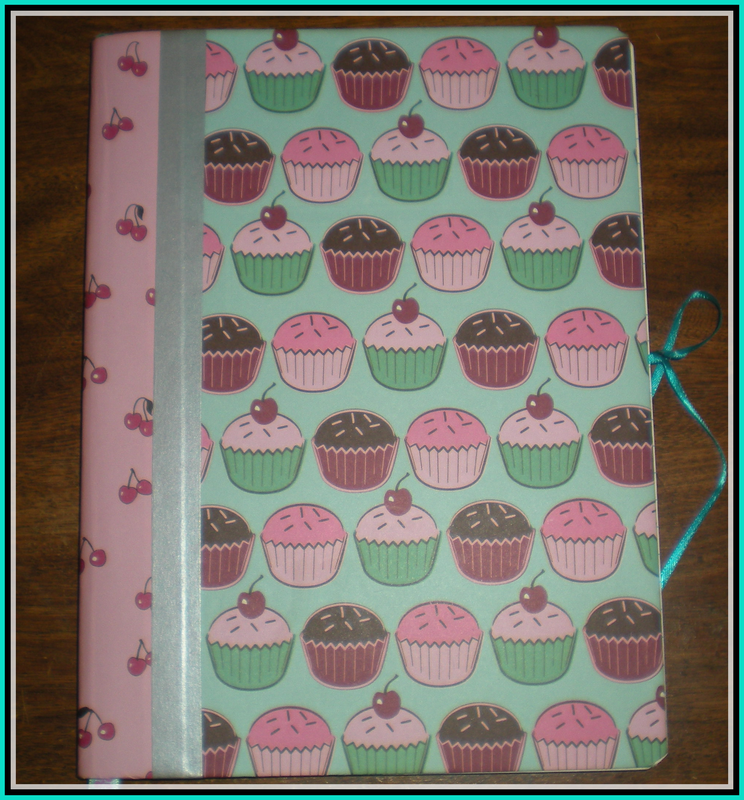 Now, I made this journal a while back and haven’t used it for anything. I figured since it had food on the cover, it would be perfect to track my food. I know that there are several food journal apps I could download on to my phone. But I guess I am just an old school type of girl. While I love technology, I don’t want to solely rely on computerized data. I like to hand write things. There is a reason I keep an agenda that I can write down important information. It also helps me remember when I write it down. Also, I like cute notebooks and setting up new ways to track my every move. I wanted everything to be laid out and ready for me to write everything down. I’m considering printing out the date, but that may waste more ink then is necessary. The bottom checklist is just for me to keep up with things. I take vitamins in the morning and then at night before bed. Three liters of water a day, I have a cute water drop tracker in my agenda. I wash my face twice a day. I will share again what I do when I wash my face one day. And I want to make sure I exercise twice a day. For now it may just be my push-ups, sit-ups, and squats done twice a day. I will hopefully bump that up to doing yoga again. That is all I have for this week. How has your week gone in fitness? Do you have goals for this week?